Banana bread, or banana loaf cake, is probably the first quick bread that comes to mind when you think of making a loaf using lots of fruit. This One-Bowl Strawberry Bread is a quick bread that is inspired by banana bread – and I mean that it uses pureed strawberries in a recipe where you would more typically see mashed banana! 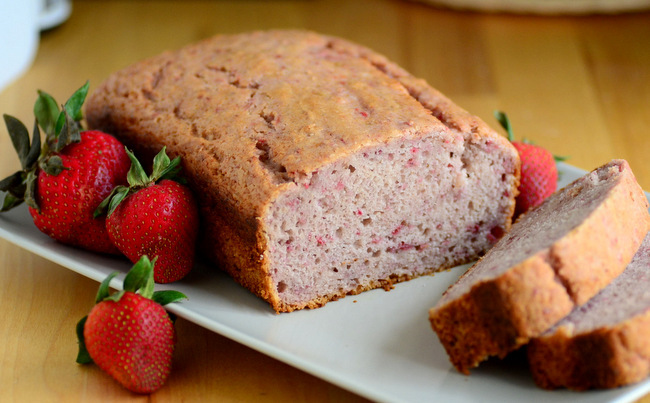 The loaf is easy to make and loaded with strawberry flavor. It’s a perfect brunch or dessert treat to make during strawberry season. I always use fresh strawberries in this recipe. In fact, it’s a great recipe to use up berries that are slightly past-their-prime or less visually appealing than your average strawberry. Save those perfect berries for strawberry shortcake and toss the imperfect ones into your blender or food processor instead! You can use fresh strawberries to make this recipe, but they should be defrosted and drained of excess liquid) before you puree them. Even though I’ve called this recipe “one bowl,” there are actually two options for putting the batter together. You can make the recipe in the food processor and use only one bowl for the whole batter OR you can puree the berries in the food processor and mix up the rest of the batter in one bowl once they’re pureed. The food processor method works surprisingly well, you’ll just have to scrape down the sides of the bowl once or twice while pulsing the ingredients to ensure that all of the flour gets incorporated. No matter how you mix it up, once the berries are pureed the batter will come together very easily. It will smell like strawberries and vanilla – and it will keep smelling that way when it comes out of the oven! The bread makes a slightly flatter loaf in a 9×5-inch baking pan and can be made in an 8×4-inch pan if you want a loaf that is narrower, but taller. Each slice has just the right sweetness to bring out a much berry flavor as possible. This is a great loaf for tea-time snacking or for serving up at brunch. It can be served as-is, or you can toast the slices and serve them with cream cheese. Food processor method: Puree berries. Add in sugar, egg, vegetable oil and vanilla and pulse to combine. Add inÂ 1 cup all purpose flour, 1 1/2 tsp baking powder and 1/4 tsp salt and pulse to combine. scrape down the sides of the bowl, then add in remaining 1 cup flour and pulse until no streaks of dry ingredients remain. By-hand method: In a large bowl, whisk together sugar, strawberry puree, egg, vegetable oil and vanilla extract until well-combined. Add in 1 cup all purpose flour, 1 1/2 tsp baking powder and 1/4 tsp salt and stir to combine. Add in remaining 1 cup flour and mix until no streaks of dry ingredients remain. Pour into prepared pan. Bake for 40-45 minutes, or until a toothpick inserted into the center comes out clean or with only a few moist crumbs attached. Allow loaf to cool for at least 20 minutes in the pan, then turn out onto a wire rack to cool completely. I never tried making strawberry bread before! Looks delicious and I love the beautiful color!